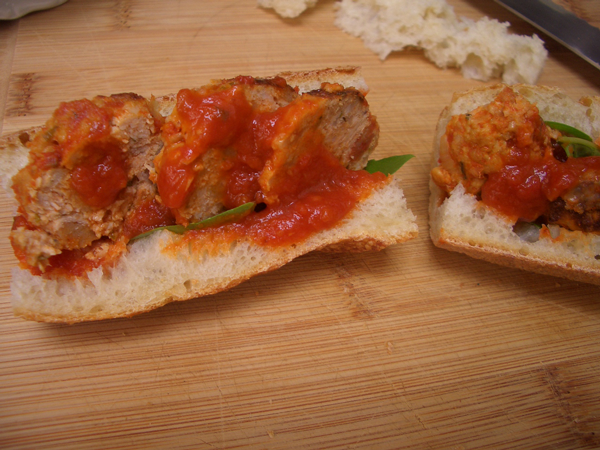 When I think of a meatball sandwich, I think of a big, drippy gut bomb that sends the consumer into a several hour long food coma. Not your typical tea time treat. But we’ve scaled these way down to a perfect little three inches or so. Easy to eat with your fingers without getting sauce and cheesy bits all over your face and lap. This recipe works equally well with ground beef or chicken. Line a baking sheet with aluminum foil and oil the foil. You don’t have to use foil, but clean up will be easier if you do. Preheat the oven to 400° F / 205° C.
Sauté the onion in the olive oil over medium heat for a few minutes until the onion is soft. Add the garlic and cook until fragrant, about 1 minute. Let cool. 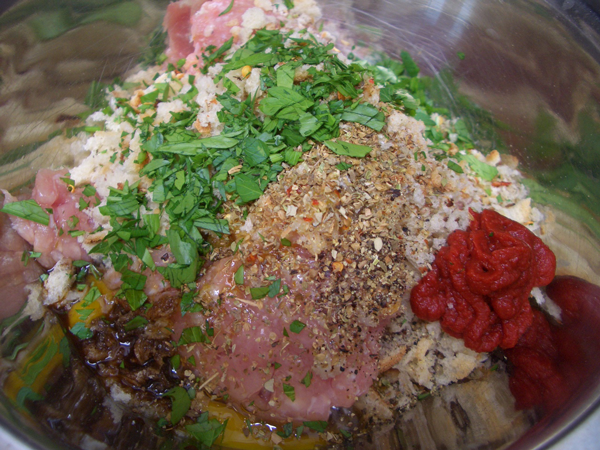 Combine the cooled onion mixture with all the other ingredients in a bowl. Using your lovely CLEAN hands (or a spoon), mix everything together until it is well combined. 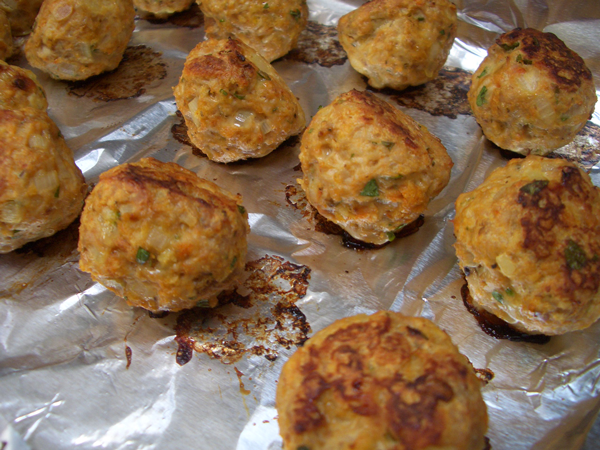 Using about 2 tablespoons per, roll the mixture into balls and place on the oiled baking sheet. 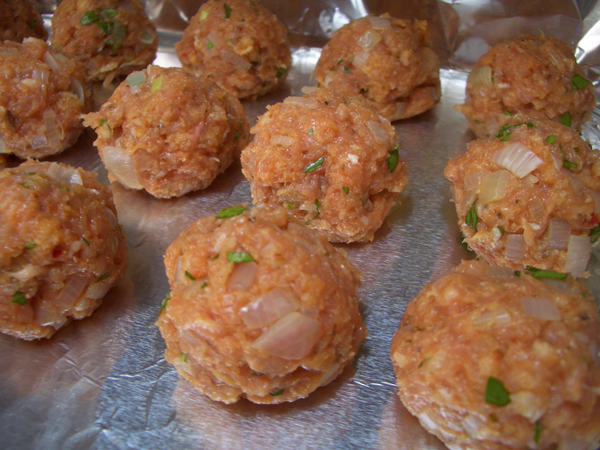 Bake the meatballs in the preheated oven on the middle rack for 20 minutes or until golden brown and cooked through. Rotate the meatballs every ten minutes or so to even out the browning. They won’t be crispy and brown all the way around, but if you rotate them they will have two or three sides that are nicely brown and the rest will be golden. Set aside until they are cool enough to handle. 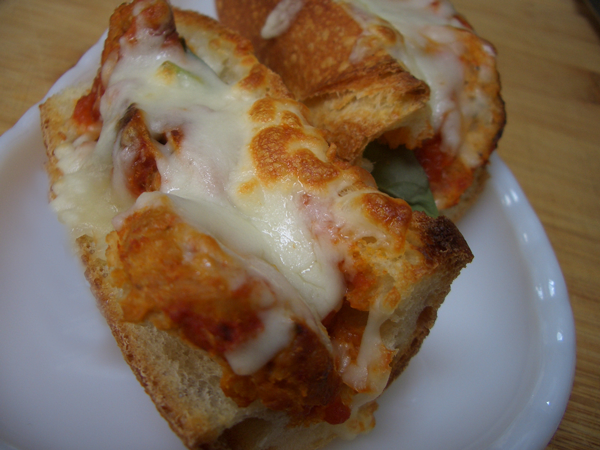 The number of sandwiches you get depends on how many meatballs you use per. 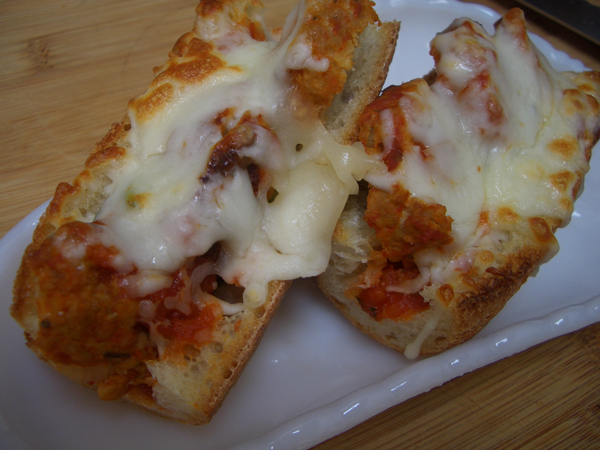 I sliced the meatballs into 4 pieces and used about one and a half per sub, so I got 10 total. 1-1/2 to 2 cups (240-480ml) tomato sauce, depending on how saucy you like your sandwiches–I used about 2 tablespoons per, so 1 cup, but it’s better to have extra just in case. You don’t want a dry sandwich. You can use any sauce you like–jarred, canned, etc., or you can make mine which can be found here. Plan ahead to use the remaining sauce for another meal with pasta, or freeze it for later. 8 oz. (225g) Mozzarella, Fontina or Provolone cheese (or a combination of two or more), grated or sliced thin. 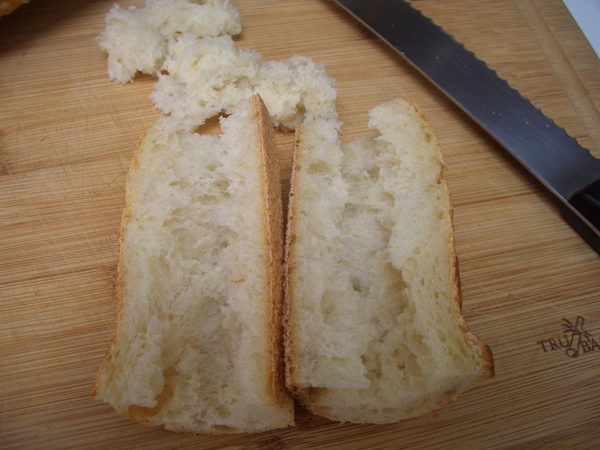 Baguette–I cut the bread in 3-inch pieces and cut them lengthwise, using each half for a sandwich. For 10 sandwiches you’ll need 15 inches of baguette. 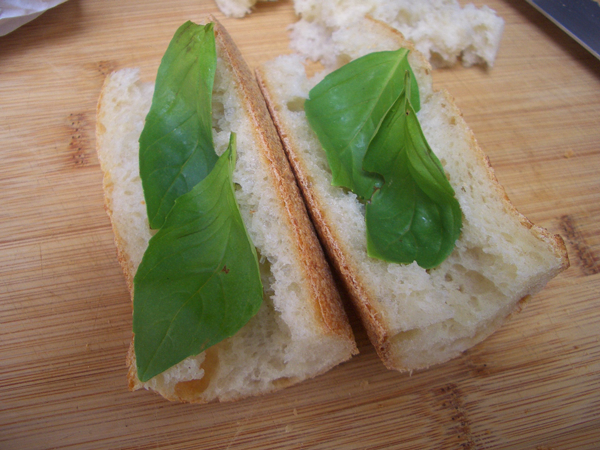 Cut the baguette into 3 inch pieces. Cut those pieces in half lengthwise. I cut them down the top middle instead of across the waist like you would for a normal sandwich. It doesn’t really matter, just try to make them even looking. Scoop out the bread in the middle. You don’t have to do this, but it makes the sandwich easier to eat by keeping things nestled in the middle as opposed to rolling over the sides with every bite. If using, add the basil. Spoon a little sauce over the bread. 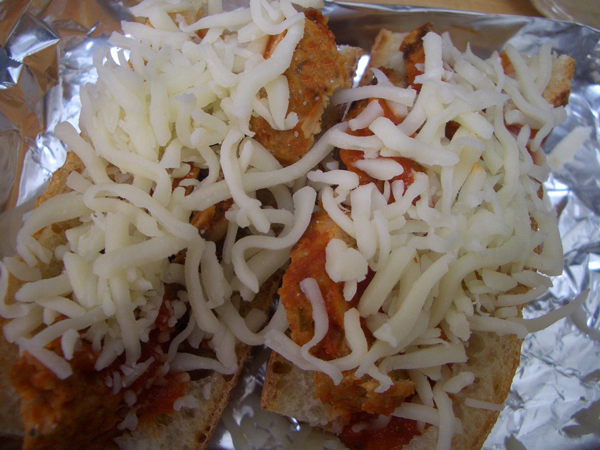 Slice the meatballs and wedge them snugly into the divot in the bread. Spoon a little more sauce over the meatballs. Arrange the subs on a foil-lined baking sheet. Put under the broiler and watch closely. You want them heated through, bubbly and golden around the edges, and that might only take a few minutes.